Hunter Holloway and Cassevel. Photos ©ManciniPhotos. Mill Spring, NC – May 31, 2016 – Hunter Holloway of Topeka, KS concluded a stellar week at Tryon International Equestrian Center (TIEC) during Tryon Spring 6, picking up major wins in the $25,000 Under 25 Grand Prix on Friday, May 27, aboard VDL Bravo S, and earning her biggest career win to date in the $75,000 Tryon Resort Grand Prix with Cassevel. Competition at TIEC continues with Tryon Spring 7, featuring the second FEI CSI 3* of the 2016 Tryon Spring Series, beginning on Wednesday, June 1. Holloway and Cassevel sealed the win, crossing through the jump-off timers in 43.373 seconds for the win, holding off David Blake of Wellington, FL and Binkie in what would have been their third consecutive grand prix win at the venue. Blake and Binkie finished in 44.86 seconds, while Bryn Sadler of Sante Fe, NM and Bon Giorno rounded out the top three with a time of 46.257 seconds. As the first to go in the order, Holloway and Cassevel nearly didn’t make the jump-off round, as they finished the track with a single time fault, but two rides later, course designer Hector Loyola adjusted the time allowed, moving the pair through to the short course. “It’s been a very cool week for us. Each one of our grand prix horses has won a big class this past week. I think it’s a great feeling and it also makes you appreciate your horses. It’s such a great opportunity and we’re so lucky to have the rides on these guys. They’re a really special group and I just am so ecstatic right now,” she continued. Holloway’s groom Gerardo Lopez was awarded with the Groom’s Initiative Award presented by Mark Bellissimo and the Tryon Equestrian Partners in recognition of his hard work and dedication to the care of Holloway’s grand prix mount Cassevel. The Under 25 Grand Prix Series has become an incredible stepping-stone for some of the world’s most talented riders under the age of 25, offering an opportunity to gain valuable grand prix experience in a competitive atmosphere. “These classes give you a sense of confidence that I think is really important when you start looking at competing in some of the bigger classes throughout the year,” she added. VDL Bravo S, a 2006 Dutch Warmblood gelding (Ephepe For Ever x Urbine S), has been a strong mount for Holloway and the duo have produced several top results throughout winter and spring season. Holloway feels that there is more to come from the pair, as they’ve just begun to find a rhythm this season. Kristen Vanderveen of St. Charles, IL guided Lucky Strike, owned by the Hays Investment Corp., to victory in the $25,000 1.50m Suncast® Open Welcome Stake on Thursday, May 26 at Tryon International Equestrian Center (TIEC). Vanderveen and Lucky Strike finished the jump-off round in 38.551 seconds for the win, while David Blake of Wellington, FL and Baron finished in second place with a time of 41.022 seconds. Darragh Kerins of Wellington, FL and S&L Through the Looking Glass rounded out the top three crossing through the timers in 41.76 seconds. Lucky Strike, a 2006 Holsteiner gelding typically campaigned by Brandie Holloway, found his way to the winner’s circle with Vanderveen in the irons after Holloway was recently sidelined with an injury. The pair bested 10 combinations that returned for the jump-off round, while six pairs finished the afternoon with a double clear effort. In the CWD Low Adult Jumper 1.0m division Julia Gates of Easley, SC and her own Sierra captured divisional honors for their performance throughout the week. Christine Henige of Maplewood, NJ and her own Fixin’ earned reserve champion behind Gates. Hunter Holloway of Topeka, KS continued her dominance in the jumper ring, earning the Ariat Junior/Amateur Owner Jumper 1.30m division aboard Avant Guarde, owned by Serenity Ridge Farm. Holloway also collected reserve champion awards aboard Deluca Ace owned by Amy Hunter. 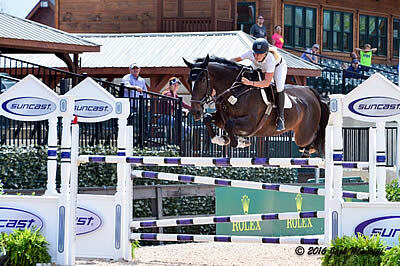 David Blake and Quantero 2, owned by Pine Hollow Farm, finished atop the leaderboard in the Nutrena 1.40m Open Jumper. Ricardo Villa of Campobello, SC and Carolina split reserve honors with Daniel Bedoya of Magnolia, TX and Quattro. In the BMW Open Jumper 1.20m, Jamie Buis of Weston, FL and VDL D’Inzeo finished the week as champions of the division, while Julio Ledesma of Wellington, FL and Chaco 34, owned by Francesca Damasceno, captured the title of reserve champion. Daniel Geitner of Aiken, SC and Damocles, owned by Janet Peterson, took top honors in $2,500 USHJA National Hunter Derby, finishing the class on a final two round score of 181. Daniel Bedoya of Magnolia, TX and Front Page, owned by Eduardo Leon, captured second place with a score of 178,5, while Penny Lombardo of Loxahatchee, FL and Big Girls Don’t Cry, owned by Rodney Bross, earned third place with a score of 177.25. Geitner and Damocles earned a first round score of 88 and returned for the handy round to receive a 93 to seal the win. Bedoya finished just behind Geitner with a 87.5 and rode to a score of 91 in the handy round. Lombardo finished the afternoon with the highest first round score, receiving an 89, and returned to earn an 88.25 in the handy round. Josh Dolan of Wellington, FL and Hidden Lane, owned by Page Tredennick, took top honors in the $1,000 USHJA Pre-Green Incentive with a score of 84. Daniel Bedoya and Playbook, owned by Monica Hanks, finished in second with a score of 83, while Bedoya also collected third place aboard Wynonna, owned by Loreanna Andrepont, with a score of 78. The $1,000 Junior Hunter 3’3″/3’6″ Classic saw Hunter Holloway of Topeka, KS and Entourage, owned by Hays Investment Corp., finish atop the leaderboard with a score of 175. Holloway also piloted The Governor, owned by Hays Investment Corp., to second place, with a two round score of 166. Grace Bridges of Eatonton, GA and her own Sinful collected third place with a final score of 162. Randall Johnson of Clarksburg, MD and Cantando, owned by Greener Pastures, won the $1,000 Amateur-Owner Hunter 3’3″/3’6″ Classic with an overall score of 163. Kathryn Haefner of Hamburg, NY and Columbus, owned by Kathryn Haefner LLC, finished in second with a score of 161, while Paige Wilson of Charlotte, NC and her own Dicaprio, finished in third receiving a 155. Jessica West of Charlotte, NC and Orion’s Diamond Ace were awarded with top honors in the combined $500 Pony Hunter Green Pony Hunter Classic 2’3″/2’6″/3′ with an overall score of 162. Grayson Hutchins of Di, SC and The Jaeckle Center’s TJC’s Black Pearl narrowly missed first place, receiving a total score of 161. Mary Hunter Millet of Hillsborough, NC and Just 4 Me, owned by Virginia Rollins, collected third place with a total score of 160. Hannah Loeffelbein and Watch Me, owned by Two Point Equestrian, LLC, took the ASPCA Maclay, while Ashley Parker of Irmo, SC and her own Calvin Klein finished in second place. Mckenzie Shearon and Chezney, owned by Andrew Kocher, collected third place in the class. The THIS Children’s Medal saw nine entries compete for the top title, while Peyton Kanstoroom and her own Centrico earned the victory with a score of 87. Rawleigh Harris of Mt. Pleasant, SC piloted Redford, owned by Bryden LLC, to second place with a score of 84. Abigail Poss of Locust Grove, GA and her own Elvis finished in third place, with a final score of 83. For more information on competition at TIEC and to see a full list of results, please visit www.tryon.com.